California's State Route 1 is a highway that runs North-South through most of the state. Most of it segments off to what is called the Pacific Coast Highway (PCH), a beautiful scenic highway that takes motorists up and down California's coast for about 655 miles. The PCH is the quintessential road-trip highway because of the length of the highway itself. It is a straight-shot route that cleaves through the western-most part of the state and provides a quick way to get from city to city but also offers scenic views. Some commuters may zip up and down the highway on their way to work or school, but leisurely drivers who take time to view the scenery are rewarded with a diverse and exciting landscape. A good portion of the highway runs along the actual coastline, and you will be able to look out at the ocean from your car. The PCH was not built all at once. It was cobbled together under the 1964 California Highway Renumbering by combining several other smaller highways. It is now a major passageway between Los Angeles and San Francisco, the two largest cities in California, so as you can imagine, the PCH sees quite a bit of traffic. An unhurried drive up the PCH can take one full day, or perhaps more if you make a lot of stops. There are innumerable beaches, parks, tourist attractions, and restaurants along the way. We highly recommend that if you have the time, you drive through the PCH admiring as much as possible, since it goes by historic California cities like Malibu, Monterey, Redwood City, Montecito, and Santa Barbara, each with their own distinct sites. Big Sur – A region in the central coast of California where the terrain creates stunning views. Big Sur is a popular camping destination and boasts Cone Peak, which is the highest coastal mountain in the lower 48 U.S. States. 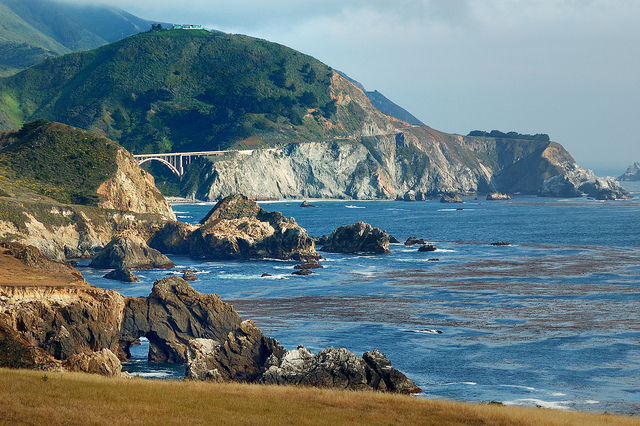 Big Sur stretches across various counties, including Monterey County, San Luis Obispo County, and San Francisco. Hearst Castle – An historic mansion in San Simeon, California. Hearst Castle was built in 1919 for famous newspaper publisher William Randolph Hearst. It is now a historical monument that offers tours every single day. Point Lobos State Reserve – A nature and marine reserve that covers 5.36 square miles in Monterey, California. There are many trails for hiking, as well as beaches. It stands as a monument to wildlife and ocean life with a whaling museum and scuba diving. Torrey Pines State Park – A nature reserve in the La Jolla/San Diego area. Torrey Pines has beach trails as well where you can see different types of wildlife, including skunks, foxes, rabbits, and plants like cacti. There are 8 miles of trails for hiking aficionados. Golden Gate Bridge Park – This park, adjacent to the famous Golden Gate Bridge in San Francisco, is very easy to get to from the Pacific Coast Highway. Taking U.S. Route 101 from the PCH will allow you to drive over the bridge itself. Testarossa Winery – One of the oldest wineries in the California. It was built in 1888 in a stone building that used to house a Jesuit Seminary school. Testarossa Winery is in Los Gatos, California, and hosts wine tastings and events. Monterey Bay Aquarium – Considered by some to be one of the best aquariums in the country, the Aquarium was founded in 1984 at the location of a former sardine canning facility. There are more than 600 species on display, so it is quite easy to plan your whole day around activities at the Monterey Bay Aquarium. For more road trip ideas, read our Top 10 Scenic Drives in the U.S. and our New England Road Trip blogs.